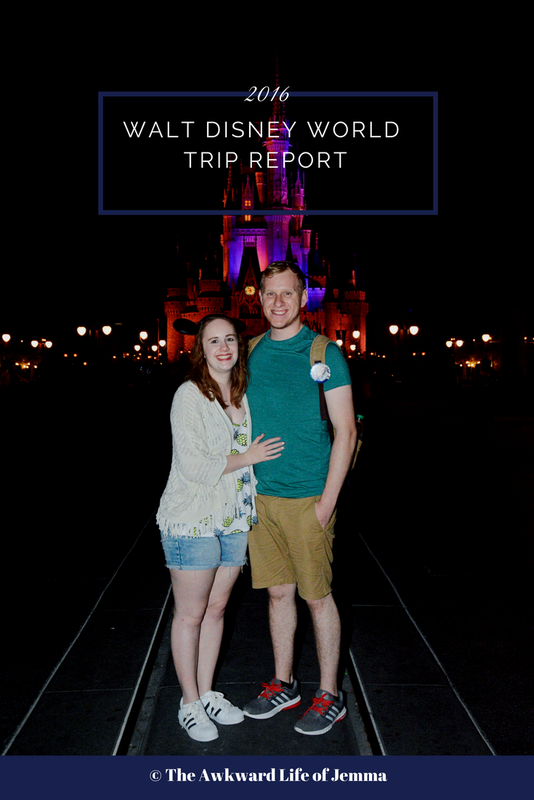 Wow, I can't believe it's day five of Blogmas already! I'll be honest I am scheduling this post (if you've read my last post you'll know why) as I am trying to keep my mind off of things and keep things as normal as possible. I'm sorry I've not had the chance to write much to accompany this post but I thought I'd publish it anyway as you'll get the gist of it. Everything shown and linked is something I genuinely want for Christmas, something Harry wants or something I think he'd like and intend to buy for him (here's hoping he doesn't read this!). 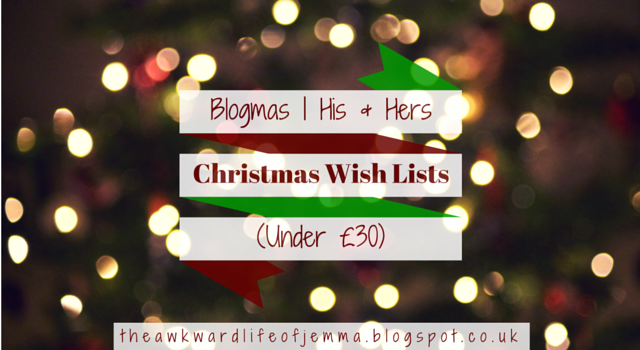 I hope this post gives you inspiration for any of the men and women in your life if you're struggling for gift ideas and everything listed is under £30 too (there are a few real bargains!). There are lots of things for people who like to bake, read, play games etc. There's quite a few skincare and beauty bits as well and the odd gadget or two. 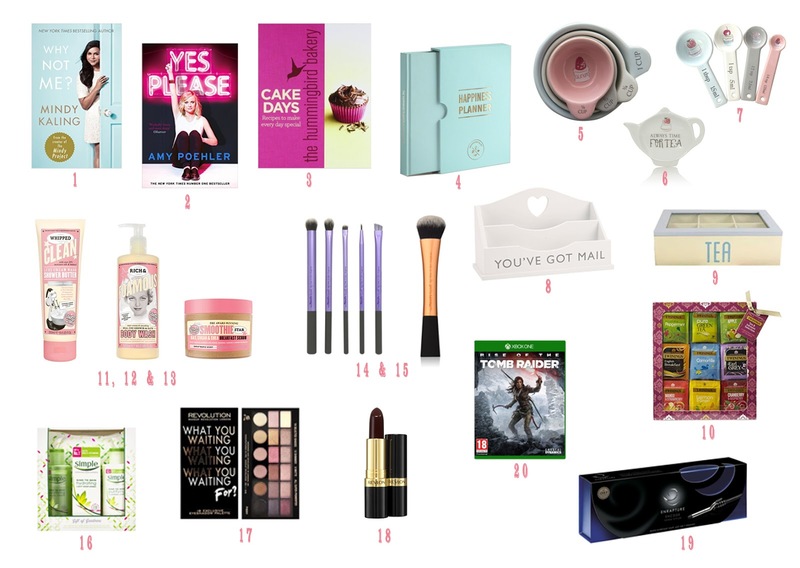 I'm really excited about my wish list this year as there is so much variety and I would be genuinely thrilled to received any of these gifts. I absolutely adored Mindy Kalings first book, 'Is Everyone Hanging Out Without Me?' so of course I can't wait to read her next instalment and that has encouraged me to read about some other female comedians too! There are lots of great women like Amy Phoeler and Tina Fey who have written their own books so these would be great for any girl that loves comedy. The Happiness Planner is perhaps one of the prettiest planners you could ever receive and I'm really keen to introduce some more positivity in my life. I've going to try out the 100 Happy Days first but you can go the whole hog and get a whole year one! You know how much I love baking so I couldn't resist this range of cake themed measuring cups etc. from Asda. I also borrowed a copy of Cake Days from the library and was really inspired by the format (instead of listing the recipes by type they are listed by occasion) it's a bit more like Pinterest I think. It's been out awhile so you can pick one up for just £5 now! These gifts are a bargain for anyone who loves baking but I've also picked out some other pretty home accessories like the tea box and letter holder. I've never been into luxury bath products before but after smelling the Soap & Glory Breakfast Scrub I wanted the whole range and these are great to be treated to at Christmas. I've picked individual products I couldn't find a gift set that included this range but you can pick up some amazing Soap & Glory gifts too. I've got much more into makeup this year and I've watched lots of tutorials on YouTube so I've decided it is time to try out some decent but still affordable brushes from Real Techniques, the starter kits make a great gift! I've also picked my essential skincare from Simple, a pretty palette from Make Up Revolution and a gorgeous winter berry lipstick. One of the more pricey items is the Encode Totem Styler which did the rounds a couple of years ago and was featured on lots of blogs and YouTube channels when it was priced around £70. Now it's gone down to under £25 which makes it a bit of a bargain so I thought it would be a great curler to try out after watching Meg's (Wonderful You) tutorial recently. Finally I'd love to receive Rise of the Tomb Raider (which I just realised is £39.99 so not under £30 sorry!) because I loved playing the last version so much! It's the only game I'll play that isn't one of the Lego games! Harry loves big band and swing style music like Frank Sinatra and Michael Buble so when he saw the Ministry of Sound 'When Cool Was King' compilation advertised he knew he had to have it! On the other side of the spectrum we've both been singing along to Justin Bieber recently although we hate to admit it! He also likes to think of himself as a bit of a gentlemen so I picked out the Modern Gent's Shaving Kit from The Body Shop which I think he will love while he chose the wash bag which I think is really nice too. Harry's also just got into styling his hair so this Vo5 gift tin is a great affordable gift. To complete the set Harry picked out a navy blue bow tie which I think will be great for New Year's Eve (I've ordered him a tartan one for Christmas day!). Being a guy there are tons of films, TV series and games that Harry wants. Pretty much anything superhero related is a good choice! I don't know much about games but the Uncharted Collection would be my pick, you get three games previously released on the PS3 but great for anyone that really loved them or someone who's never played them before. To go with the games a set of gaming headphones is a great gift. These ones are wireless which makes them even better and because we watch all our TV through the Xbox One it means I can use them after Harry's gone off to bed if I want to stay up and watch films with the volume turned up! 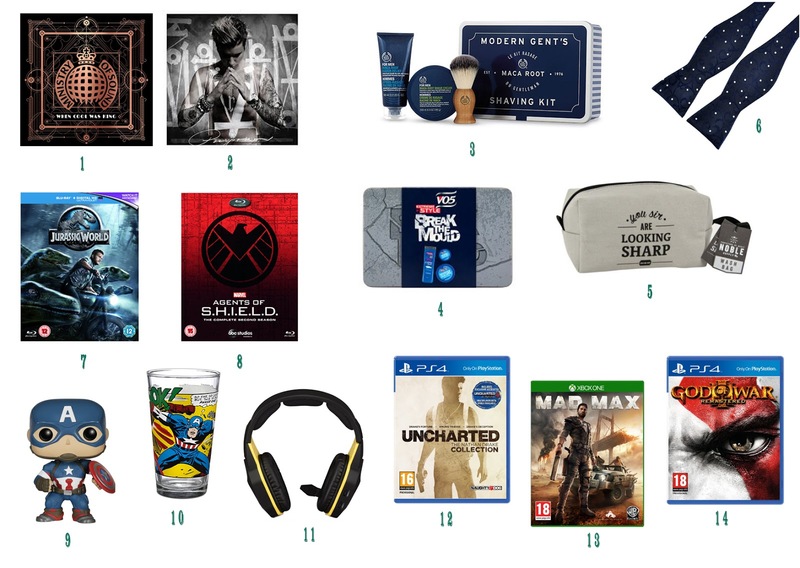 The last couple of gifts are both Captain America themed because he is Harry's favourite character but you can also get the glass (from the Disney Store) and the Funko Pop figure in any of the Avengers characters. I think these are so cute to get on Christmas day and they make opening presents a bit more fun when there is something novelty to open! 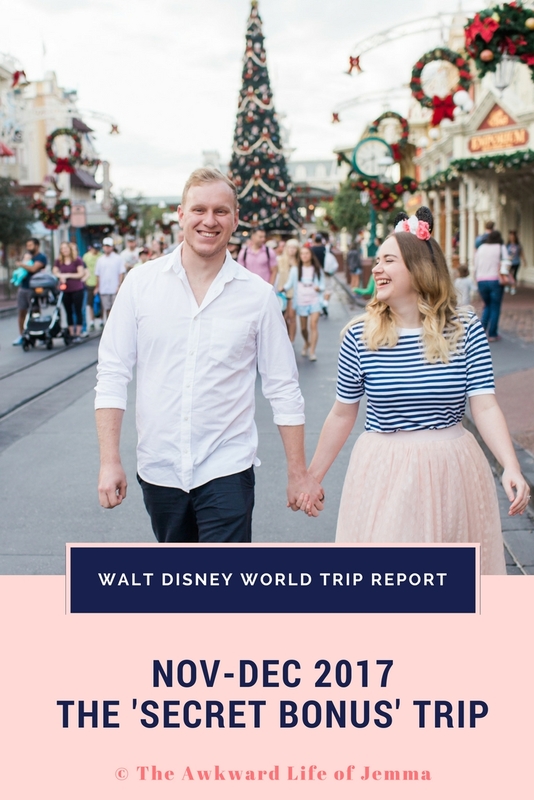 I hope you enjoy reading this little roundup of our wish lists and that it gives you some inspiration for the man or woman in your life too!